Summary: We offer video tape conversion of VHS, VHS-C, Betamax (NTSC only), 8mm, Hi8, Digital 8, MiniDV, HDV, MicroMV (NTSC only) tapes to new data file formats. Delivery options back to customer are use of customer provided storage media (hard-drive or flash-drive), or purchased media from Cintrex; the Web return option is not available for Apple ProRes 422 files. Services: Capture video tape content, and convert content to Data File formats returned via the Web or placed on customer provided storage media or on storage media purchased from Cintrex AV. We can deliver finished data file types such H.264 MOV, H.264 MP4, Apple ProRes LT, AVI and WMV. 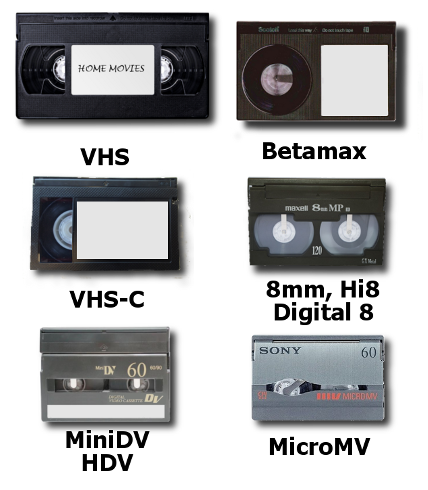 Supported Tape Formats: We support NTSC or PAL formats for VHS, VHS-C, MiniDV, HDV, 8mm, Hi8, and Digital 8 camcorder tapes. For Betamax and MicroMV tapes, we do NOT support PAL formats. Transfer prices: The transfer price for converstion to MP4, MOV, AVI or ProRes 422 is $25.. PAL or SECAM tapes have a $10 retail markup. There is a $10 charge for each video tape longer than 3 hours in length. Quantity Discounts: Orders of 10 or more tapes are given an additional 10% discount off our retail price, and discount increases are given at 25, 50, and 100 tape quantities. Transfer Process: We examine video tapes prior to play, repairing tapes as needed ($20), and will clean VHS tapes with our TapeChek 400 industrial machine to remove loose particles. Each video tape is played in the appropriate tape-deck, and its contents are digitally captured by specialized software, with the capture process enhanced by use of time based correction and sync hardware to correctly match video and audio output. We then use Adobe Creative Cloud PremeirePro and Encoder to edit the digital content and reformat it into your requested data file format. Order Turnaround: Average turnaround for your order is 2 weeks from receipt of your order into our lab back to your doorstep. Optional Extras: Digital Noise Reduction to remove video content graininess ($15); Onscreen Titles ($10); Video Tape Repair ($20), and Custom Edits ($85 per hour for editing time). From Charles Huey of Granbury, Texas on 7/14/2016 .